• The term “Tadâ” is derived from the Bikol dialect which literally means leftovers. It is inspired by Alay Kapwa, the Lenten Program and Pondo ng Pinoy project of the Archdiocese of Manila. An initiative of Bishop Joel Z. Baylon of the Diocese of Legazpi, it was likewise instigated by a previous poverty alleviation project called “Mumho” in the Diocese of Masbate when he was then its Bishop. • “Tadâ” focuses more on the sharing of time, talent, and treasure with our fellow men and women, seeing each one as a “neighbor.” It is the practical observance of the Church’s preferential treatment for the poor and the oppressed as a way of journeying with them in their struggle for genuine human development. 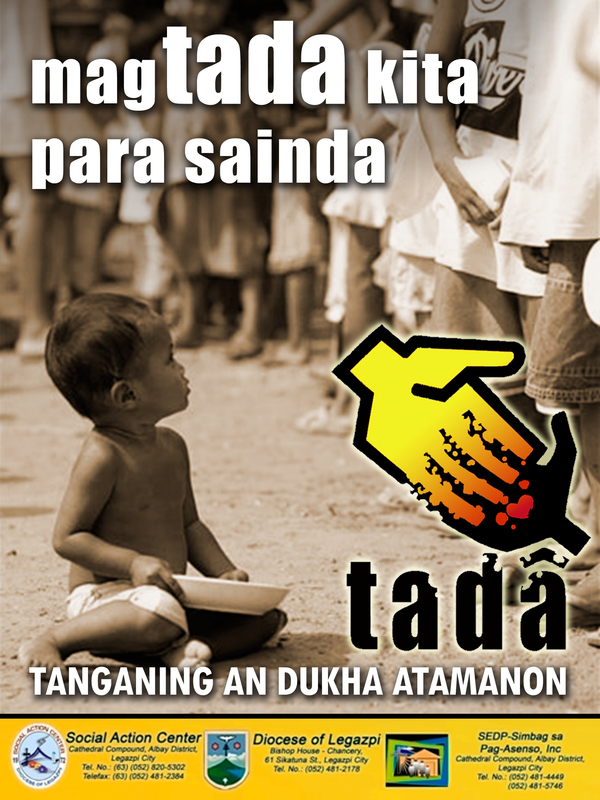 • Thus “Tada” becomes a mechanism, a means of providing bridges and making the necessary meaningful connections in order to carry out the main goal, that is – Tabangan an Dukhang Albayano (to help the poor of Albay).